The International Bamboo Conclave is on this weekend (22-23 Feb, 2014). Lucky you if you’re in Bangalore (India). Head out to the University of Agricultural Sciences. The gathering provides a forum to promote bamboo for integrated development. There are technical sessions and an exhibition of products. Experts have gathered to discuss policy issues, innovative technologies, its use in buildings, furniture, handicrafts and other cottage industries, skill development in the bamboo sector, and global trends. India is the second largest producer of bamboo in the world, next to China. India has 128 bamboo species belonging to 18 genera. They make up 12.8 per cent of the total forest area in India. 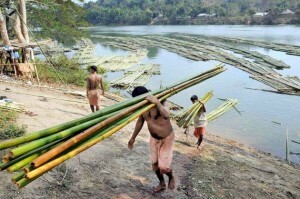 For all the potential benefits, India lags in utilising bamboo. Apparently it all started with the British calling it the ‘poor man’s timber.’ Current government policies are not helping either. Bamboo is classified as timber in many states and permits are needed to harvest it. The Indian Forest Act effectively provides the forest department a monopoly over bamboo and creates opportunities for corruption and harassment. Bamboo has the potential to generate economic wealth – sustainable and equitable development. Imagine if bamboo was put in the hands of the local people? To grow, to harvest and to add value? People determining and influencing their own future? Sounds democratic to me. What do you think? This entry was posted in All, Bamboo around the world, Bamboo craft and tools, Building and Home Renovation and tagged architecture, bamboo, bamboo forest, China, India, low-cost housing on 23/02/2014 by Deb.